Prefer to see the visual? 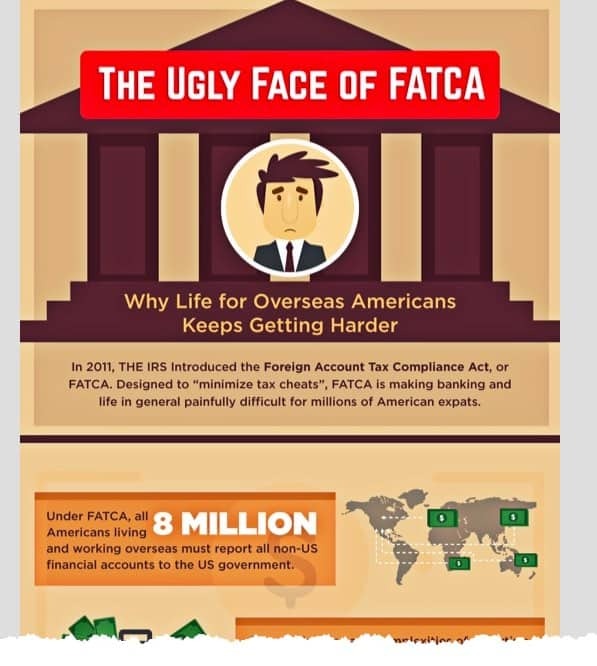 Check the full FATCA infographic here. Or read on to enjoy the text version. In 2011, THE IRS Introduced the Foreign Account Compliance Act, or FACTA. Designed to “minimize tax cheats”, FACTA is making banking- and life in general- painfully difficult for millions of American expats. The ambiguities and complexities of reporting under FACTA mean that many expats, most of whom are not wealthy, spend thousands of dollars every year to ensure that they are in compliance. If a bank does not agree to comply with FACTA’s stringent reporting standards, they are subject to a 30% tax on ALL US-sourced income. However, rather than risk the consequences of accidental non-compliance, many banks are simply refusing to do business with Americans. Rather than deal with FACTA, Americans are renouncing their US citizenship in record numbers. And no matter your nationality, you are now required by all 77,000 FACTA-compliant institutions to fill out a FACTA form when applying for a new bank account. Spread the Word about FATCA – Share this Infographic! Thursday Sept 15, 2016. 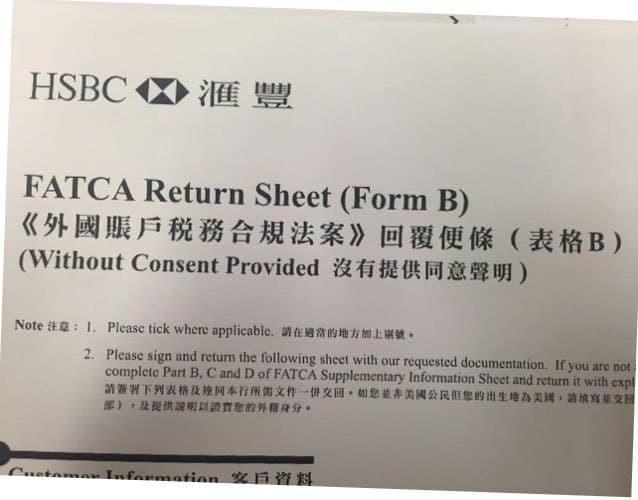 Seems the Hong Kong and other global banks are still adapting and adjusting to the FATCA regulations. 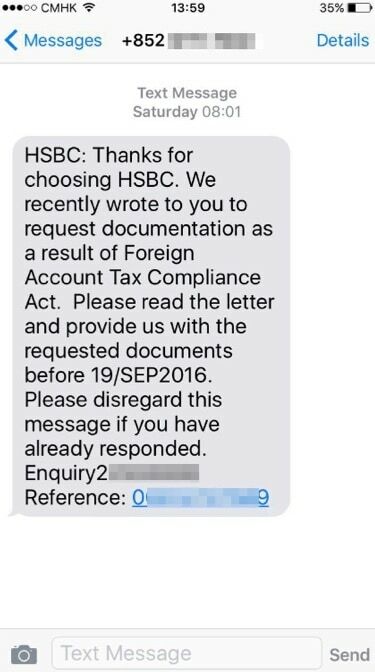 A friend of mine got this text message and is now in the HSBC bank handling it. He says he complied with everything they asked him before – but now are asking for more things. So he went into the branch. Even though he did it for his company accounts in the past – now it was also being brought up for his personal. He thought since its the same bank they would cross reference. Seems they have a whole case on the FATCA filing for him as well. Imagine every client in the bank has one of these. All this extra paperwork. Germany 2 months ago when I opened a bank account for my 12yr old son. So I am in a bunch of Expat Facebook groups, and this is a discussion in one that I couldn’t resist to share on the blog. This gives people a better idea of how it is really messing up American’s lives living abroad. Some foreign financial institutions (banks, brokers, wealth managers, mortgage companies etc) don’t particularly like the facta reporting idea, therefore, they prefer to have no US person accounts on their books any longer. Oh yes, as Brian reminds us, below, the penalties for the banks if they mis-report are terrifying: 30% withholding tax on all the bank’s investments in the US. And a 30% withholding against income to the us citizens account. See my recent letter attached from Edward jones. I have lived, worked and paid German taxes here in Germany for over 40 years. Now, due to FATCA, I no longer even have a bank account. My bank decided it was easier to throw me out than to worry about making an error in FATCA reporting. if I am correct, you have the right to an account according to German law. How can you get paid without one? I only used the banking services of my investment bank, which no longer wanted me as a customer. These were the only accounts I had in my name. My wife has a bank account, that works for us. I’m sure I could get a “basic” account at a local bank, but I do not want to apply for one. Actually the problem is not with citizens reporting their foreign bank accounts (that has been on the books some 30 years), but with the fact that foreign PRIVATE institutions are required to report to the US government on US citizens. How is this different from the laws under Hitler and Stalin when the neighbor had to spy on their neighbors? Are we now the UNITED SOVIETS of AVMERICA or is it HEIL MR. PRESIDENT? Furthermore, FBAR and FATCA require a US citizen to report any account in which they have signature authority, such as THEIR EMPLOYER’s account, their FOREIGN SPOUSE account … and the US will not compensate the citizen for loss of job, law expenses for violation of the employer/employee non disclosure agreement, or divorce from the foreign spouse! That part about the non-US spouse is the crux of it. Dear I wish more people who didn’t know would ask like you did! Thanks for being interested and curious. I guess it varies between countries and institutions, we haven’t had any issues with this (yet), being expats and homeowners here. I live in the UK and haven’t personally suffered harm. However, I don’t bank with a bank who has a US presence. And therein, I think, lies the difference. Touch wood, my bank will stay out of it. I have had issues with the U.K. when attempting to open non-resident business accounts. Yeah, imagine living in a place like Manila where kidnap for ransom is a problem. 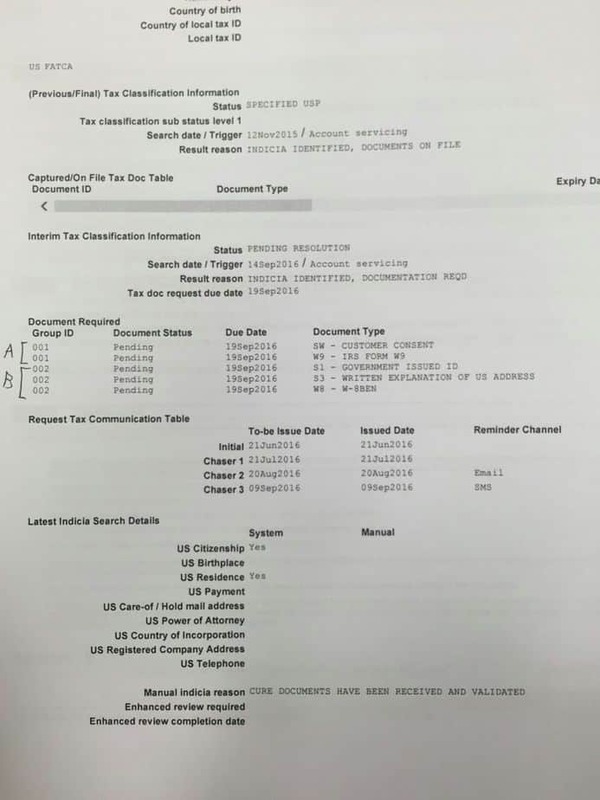 Last thing I want is some underpaid clerk at the bank collecting my personal data on orders of the IRS and then sharing it with corrupt underpaid banana republic government officials who have to review the data on order of the US Treasury IGA with the Philippines. Hell No! Happening in Canada too. Just got the letter for the first time after living her since I was 18. My bank is adamant I fill it out. How did they even know I was a us born citizen? If you have showed your passport at some point, it’s in there. Or you have stated country of birth in some form to the bank. This is exactly my story. I do not have 15,000 sitting around now to pay all of this to exit. I need this money for my kids. Keith says to do nothing, yet my bank insists I fill out the w9, now! I will, and wait it out. They can’t squeeze blood out stone? And now. All Americans without social security number will not get an account in many countries. Banks are required to get TIN within 90 days of on-boarding. It can take up to 8 months to get social security number. Some banks in Panama have started to charge “Maintenance fees” of over 200.00 a year to pay for the paperwork. Being a US citizen and trying to get an account is nearly impossible because of the paperwork. We’ve had one for many years, so it hasn’t affected us, but some people had their accounts closed. They made us sign a W9. All money we have is earned at taxed at the source, but they don’t seem to believe it. not anymore. Serious crackdown under way. Because the banks won’t accept American accounts, get rid of those they have, call in loans, including mortgages. In some cases people are denied jobs because the banks won’t let them have signatory rights which will be part of their job.Pension companies and insurance companies will deny Americans. Other than that there is no problem. I’m trying to buy my dream house in France. Banks and mortgage loan people told me my American nationality would make it much more difficult because of Fatca – if not outright impossible. USA is “holding the world hostage” over this. …(5) years of tax return? That’s over reach! I thought it (W9) only had to be signed and reported by your bank, who then reported your government, who reported to the IRS. Is it different in Europe Keith Redmond ? Switzerland is a special case. Most places only require the W-9. I think it’s more that they started in Switzerland before other countries – I wouldn’t be surprised if this is the direction it will go for other countries in the future. Wow! I would not like my tax returns with all my personal info being passed around a bank in this day and age of identy theft! No choice. Submit the tax returns, or lose your bank account. Why should a local be discriminated against due to their birthplace in order for them to export their privacy to a corrupt foreign nation? FATCA is a great law if one condemns human rights. You also have to consider that we Americans are all getting registered and handed to the authorities. Not so dangerous in Norway at the moment. But in certain countries it might be. It’s a gold mine for different countries intelligence services etc. Main problem. Not every country is Norway. I know. The problem in Norway is that the different government departments aren’t exactly great at cyber security. So hackers could possibly get hold of such information. The root of the problem is citizen-based taxation (CBT). FATCA is an enforcement arm, but that in itself, while invasive of our privacy, is not the biggest problem. How Has FATCA Affected You? I’d love to hear from readers who it has affected you. Seems not only Americans, but anyone in the world now is affected. Bankers are asking if you are American, and often denying you a bank account if you are a US Citizen. Those who aren’t have to pledge and sign they are not, and they have no US citizen business partners either. Seems scary. I’d love to hear more from you, please leave a comment below. FATCA is the tool to enforce the immoral practice of “US place of birth taxation”. It’s unjust. It’s unfair. People do NOT choose where they were born! FATCA forces private foreign companies to spy on their own customers for the benefit of the US government, without any compensation in terms of cost, and without any benefit to the foreign financial institution (FFI). FATCA is causing a lot of personal issues in marriages and for the children of Americans abroad, it’s causing people to have to choose between their family and country of birth and these are not the “rich fat cats” this law claims it targets! The fallout and harm being caused are horrible! Belize or Hong Kong Company Structure? Stripe Launches Atlas - Future of Cloud Incorporations? Will Amazon FBA Be Shutting Down Seller Accounts for Foreigners in China?